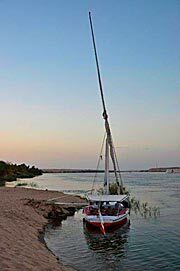 To do an overnight felucca tour it is necessary to get permissions from the tourist police in the evening before the trip. For this the captain needs copies of your passports in advance. 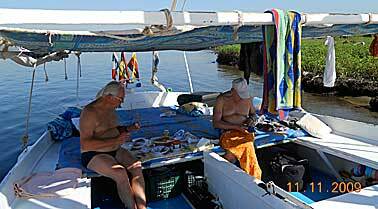 Both captains will prepare the felucca well the day before to be ready on the day of sailing (for example: check if all is in "the kitchen", dry blankets after washing - see 3rd picture). In the morning of departure the captain will get ice for the ice box, fresh vegetable, fruits, meat or fish. Then he will sail to your hotel to wait for you there: usual time of meeting: 10 am. Check out after breakfast the 2nd, 3rd or 4th day. (If you will stay at Anakato which is located far south from Aswan you will have to come to Elephantine by motorboat provided from Anakato). Edfu (3 days / 3 nights. Checkout 4th). But this is no problem, as we will send you a car / microbus to take you to Luxor with stops in Komombo and Edfu – and there is no difference for you, if you get picked up from Daraw, Komombo or Edfu or some place between them. If you want to visit a village during a 1-day/1-night-felucca-tour you can choose between a Nubian OR Egpytian village (1 hour). Both villages cannot be visited on the same day, because they are too far apart from each other. For overnight tours the back of the felucca is filled with futons to sit or lie soft during the day and night. For the night wind shields are wrapped around this futon covered place, a mosquito net can be provided. The captains sleep in the front to make sure they don’t disturb you when you go to sleep. Your “Bathroom” is the Nile to wash, for brushing teeth water is provided (from the tap in a big canister). Also the dishes are washed with the water from the canister. If you need to relief yourself, the captain will stop at a beach. Please follow his advices which bush to choose to hide behind. There are farms along the Nile behind the dunes and of course the locals don’t like foreigners to use their fields. Also - please be clean as cats: it is easy to shove some earth / sand aside with your feet, and then cover well (!) what you will have left. I think, you would also shout out loud, if foreigners would pass your ground, the wind plays with flying dirty toilet paper after their visit, or there are smelly mines to step on. Also other travelers who will visit the same beach after you will be happy if they return to their felucca with clean feet (especially if they will be out after dark). - Please take off your shoes as soon you get on the boat. - Please don’t throw cigarettes in the water as this is polluting many liters of Nile water. Softdrinks or alcohol is not included. 125 USD for microbus incl. driver. 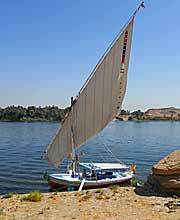 * if you are more than 5 persons a bigger felucca is needed. and when depart from Aswan? Please don't worry, the captain will arrange all paperwork without need of your presence. The copies of your passports will be stamped at the tourist police on the previous day and the captains receives papers for their licenses, the captains themselves, stamped photocopies of your passports plus a red paper to be copied from the captain to give to the Nile Police on the first day of your overnight trip (all papers, see photo on top picture). The next morning (first day) you start at about 10 am and when sailing out of Aswan the captain has to stop at the station of the Nile Police (2nd small picture). There he has to leave the papers except one to have with him in case he will be asked from some Nile police on the way north. Sometimes feluccas have to stop at the Nile Police until noon because the officer in charge is not there. Of course the captains feel sorry for their guests and also would prefer to start sailing to make it in time to Daraw, Komombo or Edfu, but they cannot help it. When Sero sees feluccas waiting at the Nile Police, he prefers to do a round, sail back to Aswan so his guests enjoy sailing instead of sitting on the felucca in front of the police station and wait for the papers to be done. As soon the police officer shows up, the feluccas start to move and Sero gets the papers from the police right away. I had requested an 08.30 start to give us the best chance of getting there. We checked out of the Moevenpick (Elephantine Island) and the felucca arrived on time and picked us up from the dock. The captain then said he still had to get the permit and left his mate to sail us in circles around the hotel for the next 4 hours before returning." We are very sorry about this review, the captain had tried to do his best by even starting the felucca tour 1.5 hours more early than usually to fulfill the guest's wish, but on that day the Nile police had opened even later so the felucca could not leave Aswan until the police officer in charge arrived. So the captain thought his guests would be happy to sail around Aswan instead of waiting at the police station. After this review we have decided that the tour always starts at 10 am, no matter if a guest wishes an earlier start. Regarding the felucca tour, everything was fine. The captain and the crew were very friendly, took us to many nice places and cooked excellent food! On the street some captains offer "for 20 only". Please be warned, that usually this will be in USD, English Pounds or other currency. Prices you negotiate could be for the first hour only, every following hour could cost much more. Prices could be for each person, or one hour is 40 minutes only. The tour could be used to be intrusive and a second captain sell all kinds of souvenirs, etc. etc. Of course it is up to you to decide if you prefer to negotiate on the street or if you want to reserve with services and agreements written down by email in advance, reserved with people who have been recommended to you and are keen to keep their global reputation. Also sometimes we are asked about felucca sharing. This is not offered from Aswan Individual. 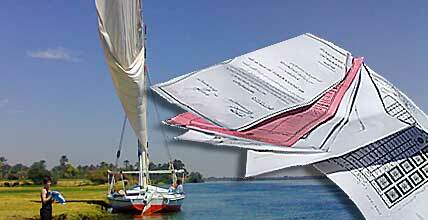 About 13 persons from different low-budget-hotels are collected to share one felucca. The food provided is very "easy", of course there is not much privacy when one puts his toe in the nose of the next traveler while sleeping. Please see picture if you are interested. Aswan Individual offers all services exclusively.